This propellant has a burn rate optimized for 6.5 Creedmoor, .260 Remington, and .30-06 Sprg. Our initial evaluation in the .300 Winchester Magnum also proves its ability to meet 2900 fps with a 190 grain bullet. 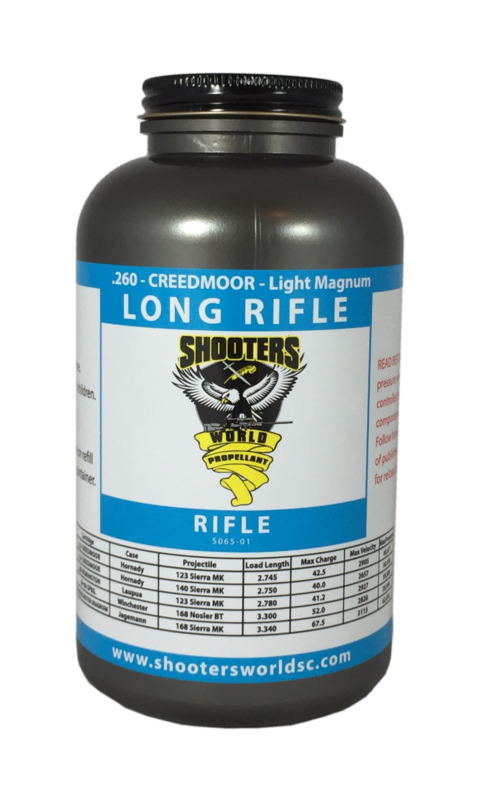 Long Rifle is optimized for the 6.5 Creedmoor. Whether with lightweight, moderate or heavy bullets loaded in this cartridge, Long Rifle yields high loading densities and optimized velocities. If you seek accuracy, one of the keys is to find a propellant that can “fill the case and seek maximum velocity”. Our accuracy testing revealed no group over ⅞ MOA, with many groups ½ MOA or better. Despite Long Rifle being an extruded propellant, we have found good flow characteristics through a volumetric powder dump. The grain is narrow, and cut short. While some reloaders insist on weighing each powder charge, we did not find that extra time necessary when loading for accuracy with this propellant. Due to its cleanliness of burn and incorporated flash suppressant, there is virtually no muzzle flash with Long Rifle. Long Rifle is a canister form of Explosia bulk and Lovex canister propellant S065.